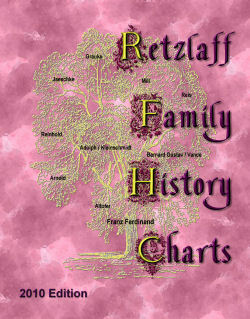 The 2010 Edition of the Retzlaff Family History Charts book is now available, and you can own you own copy of this comprehensive volume of information about the ancestors of Franz Ferdinand Retzlaff of Germany. This newly updated edition continues to utilize computer technology, even more than ever before, to improve and enhance the information provided in the charts. The book is over 300 pages long, has a full color front and back cover (as shown on this page), and is printed on standard 8.5x11 inch white paper that is wire-bound so it sits flat for easy viewing. There are many black-and-white photographs through-out the book. 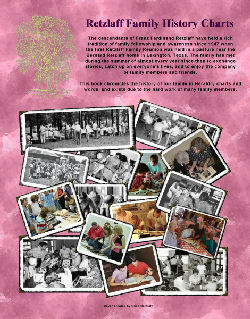 You can order your copies of the 2010 Edition of the Retzlaff Family History Charts right from this webpage by using your PayPal account. If you have any questions, please send email to either or .